Bolivar Ramirez Sensei began practicing the martial arts at the age of five. At twenty-seven today he is a man with a very muscular physique. When I first met Ramirez Sensei at the San Juan Airport, he was wearing a horizontally striped shirt, and at first glance, an image of Popeye flashed through my mind. Ramirez Sensei’s Shushinkan dojo is located in the town of Mayaguez, Puerto Rico; about a two and a half hour drive southwest of San Juan. 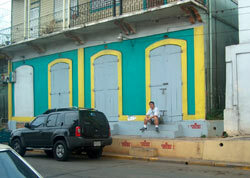 After driving through the darkness we arrived in Mayaguez close to midnight, just in time to retire for the evening. The next day, we stood on the elevated sidewalk outside the heavy doors of a building that could once have been some kind of warehouse. As Ramirez Sensei worked the key in the lock of the massive door, he spoke with a sense of sincere and humble pride “This is my practice space”. Inside, was a place of practice for the martial arts of Jujitsu, old-style Karate, Kendo, Judo and Aikido. As soon as I stepped inside I could tell that this was a place of reverence for Ramirez Sensei and his students. The six hundred square foot space was divided into two center rooms by a row of center posts. High on the wall adjacent to the front door loomed a huge winged dragon, coiled and ready to do battle with the bare fanged tiger that crouched below it. The figures were painted in great detail and took up almost the entire surface of the wall. 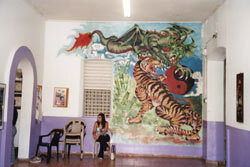 One of the main walls of the dojo was decorated with the flags of Puerto Rico, the United States, and previously a Japanese Naval flag bearing the symbol of the rising sun. A large photo of the Founder of Aikido held a place of prominence. Other walls displayed scrolls, instructor’s photos, Aikido ranking certificates, instructor certifications, and a variety of weapons. Pictures of a religious leader from India, a statute of Jesus and other sacred images adorned the corner walls near the rear of the dojo. Before arriving in Puerto Rico, I was aware that Ramirez Sensei’s dojo had about ten students that practiced Aikido regularly. In fact this was one of the reasons I wanted to visit. Ramirez Sensei is not associated with Nippon Kan, in fact he is associated with both Yoshinkan Aikido and AAA (Aikido Association of America), founded by the late Fumio Toyoda Shihan. He holds Dan certification in Aikido and in other martial arts as well. This kind of dojo has been an interest of mine because of its value in the history of Aikido in the United States, past and of course presents. Its character is a valuable testimonial, and Ramirez Sensei and his students possess a spirit that is invaluable. As I glanced around, the stage seemed set for Bruce Lee to appear, scratched and gleaming with sweat after battling the local bad guys! I say this in jest, but not with disrespect to Ramirez Sensei and his students. I sincerely enjoyed the mood and atmosphere of the dojo, and I am describing it with sincere appreciation. It brought back memories of the days when Aikido was first being introduced in the United States by pioneer instructors from Japan. In 1976, I first came to the United States to visit Shuji Maruyama Shihan, the Founder of what is now, Kokikai Aikido. At that time, Maruyama Shihan had broken relations with other Japanese Aikikai instructors in the United States such as Yamada Shihan of New York, and Kanai Shihan of Boston. Together with the late Toyoda Shihan, he was busy promoting Ki no Kenkyu Kai and Shin shin Toitsu Ki Aikido. This relationship with Ki Aikido and Toyoda Shihan eventually ended, and Maruyama Shihan went on to develop his own independent organization. Good or bad, the Japanese instructors of that time in the history of the development of Aikido in the United States, were very committed to the development of formally organized Aikido organizations and territories. What started as a united effort however eventually splintered and struggles incurred over territory and students. This was the era of the “Aikido warriors” in the United States, and especially Chicago became a battleground for instructors competing with one another. The strife between the late Aikikai affiliated Akira Tohei Shihan and Aikido School of Ueshiba’s Mitsugi Saotome Shihan has been legendary in Chicago. While both in earlier years practiced together at Aikikai Hombu in Tokyo, they became bitter rivals in Chicago. One must keep in mind that at this time, although the Bruce Lee boom was waning, his image had captured the imagination of Americans both young and old. In most towns across America, martial art dojos had sprung up, offering a multitude of martial arts; some more wizardry and foolery than viable techniques. There were hybrid martial arts whose origins were not clear. Others displayed evidence of origin readily at that time that are now denied. Korean Hapkido dojos in the United States for example, displayed scrolls with the Japanese characters for Aikido, and the photos of the Founder Ueshiba. Today these symbols of origin have disappeared. With this setting as a backdrop, changes began taking place in the practice of Aikido that still have their effects, both negative and positive today. This was a tumultuous time in the evolution of the martial arts in the United States, and the term “survival of the fittest” was a reality. During these times of struggle for territory and affiliation, the ones who suffered the most were the students. One day a dojo might bear the banner of one school, only to be replaced sometimes overnight with the title of another. High-ranking Japanese instructors who had previously worked hand in hand to spread Aikido in the United States, displayed conflicts and rivalries between themselves publicly. This dissention was responsible for the first exodus of students from these pioneer organizations that left quietly to join others or begin their own dojos. Differences and rivalries among these instructors resulted in a loss of respect from their students and ultimately reduced influence over their student’s allegiance. This dissention set a precedent that can still be seen today. Without a model of loyalty and respect, some students today feel little loyalty to their home dojo, opting instead to join rival organizations on a whim, and accepting rank and position “piggy backed” on ranks given to them by their initial dojo instructors. I have personally seen a few who subsequently displayed their rank as a nidan of one style of Aikido, a sandan of another style and a yondan of yet another. This I feel has been a negative result of the way Aikido was introduced to the United States. The effects of this era were both negative and positive. On the positive side, these pioneer Japanese instructors gambled with their own survival, and with a great deal of energy and commitment brought Aikido to almost every state in the union. This was positive in the fact that large territories and organizations formed quickly with a massive scope. Aikido dojos sprung up like weeds after a rain. Reflecting now, a negative side of such expansion may have been a lack of quality in some of the dojos, merited more as a territory pin in a map than a place of practice. What about today? The era of initial growth for the pioneer Japanese instructors has come to pass. Some have now passed away, others preside over large, well developed organizations, becoming celebrities of sorts. Others have moved on to form new independent dojos and organizations. Like inactive volcanoes their organizations have grown, disturbed now and then by an occasional political eruption. Organizations today have become well structured into pyramid systems with small dojos forming the base of a pyramid that feeds upwards. Rules for ranking and mandatory seminar attendance are commonplace as are Instructor, Assistant Instructor, and Women’s Instructor certification. All are part of a business of accumulating fees in trade for status and passport stamps. Some high ranking Japanese instructors once so eager to establish territory no long visit the frontline dojos of their organizations to teach Aikido. Instead large regional seminars are held specifically for ranking certification which all participating dojo members are obligated to attend. Dojos too small or without the resources to attend such events become isolated. Some dojos struggling to maintain a relationship within their organization offer donations; donations that might be better spent on internal dojo activities. Our system of hierarchy today reminds me of a castle lord that rules his fiefdom by demanding taxes or the service of young men to fight their wars. Throughout history these controls have eventually lead to resistance, rebellion and independence by those bound by such servitudes. I question the structure that our Aikido world organization has taken. We need to remember that all that has been built has been built on the shoulders of students. A large tree has many roots, and for the tree to be healthy the roots travel far and branch out into finer and finer root systems. The roots farthest from the tree serve an important role for the trees overall well being, and cannot be forgotten or ignored. The same holds true for the dojos on the “front line”, small yet vitally important for the further development of Aikido. An organization that claims three hundred affiliated dojos did not support the start up of each dojo financially, or offer to pay the electric bills or advertising costs of each individual dojo. Most affiliated dojos have been started by students; students willing to sacrifice their own time and financial resources for their dojos to come into being. What some parent organizations have done instead of offer support for their smaller dojos, is to offer association and certification in trade for financial reward. I think that now it is time make sure that all Japanese high ranking instructors give back what has been given to them; to complete the circle. We need to appreciate and understand the support that small front line dojos and Aikidoka have given. In Central and South American countries, dojos sometimes seem like outpost colonies. Here instructors come maybe once a year, (all expenses paid by local dojos) to hold ranking examinations and to collect fees. Although these students bow in respect, and say “Yes Sensei”, I fear they have a bitter taste in their mouths, and are left in the end with little more than debt. In the beginning, there was a sense of pride that Japanese instructors possessed; a sense of pride to be on a special mission of the Founder. That mission seems to have disappeared with some, and some of their pride has disappeared along with it. It is disconcerting that some instructors obligate their students to buy their line of Aikido accessories and products. It is hard for a student to say no if told by their instructor that they must have this kind of bokken or that kind of bag. There is a difference between a “shonin”, or vendor, and a “bujin” or samurai warrior. It seems today that the “bujin” spirit is down and the “shonin” spirit is up. Last July I wrote an article entitled Price Tag Up, Fairness Down, which has been translated into English, Spanish and Portuguese. After posting the article I received many emails with a strong vote of support for the positions outlined within. This article is written as a continuation of that article. For background, I suggest you read that article as well. This past January, a young man (I was later to learn) named Javier visited Nippon Kan in Denver. After practice he stopped at the office and asked “Would it be possible for Homma Sensei to visit my dojo”. “I live in Puerto Rico”, I overheard him say. I went out to meet him and answered without hesitation, “Okay, I will go. Please leave us your information on how you can be contacted”. I think he was surprised that I would agree to visit after making acquaintance for only a moment. After years of teaching beginning students, it doesn’t take long to recognize sincerity. Like a spark generated from striking two flint stones, it is easy to see. “Don’t worry” I continued, “I do not require your dojo to pay any of my travel expenses, lodging or teaching fees. I just need a comfortable hotel, if you could help me find one near your dojo, that would be fine”. Javier, as it turned out, was a law student, studying in Ponce, Puerto Rico and did most of the correspondence and arranging for our visit to Puerto Rico, and to his dojo; Ramirez Sensei’s Shushinkan dojo. One concept I reflected on while visiting Shushinkan dojo was that of the relevance of icons. In my recent travels to Central and South America, in the most distant villages or down the least traveled roads you can find images of Jesus, the Virgin Mary and other religious symbols. No matter when they were made, a hundred years ago or now, it is always apparent that the maker tried their best to adorn these images as beautifully as they could. At the time the symbols were made the most valuable materials available were used to decorate these images. Whether gold and silver or crushed glass, buttons or chips of porcelain were used to adorn these images, always apparent is their importance to the craftsman who made them. This I have seen not only in Central and South America, but in many countries I have visited around the world. This is true not only for Christian images, but for images of many different faiths and beliefs as well. Native American people for instance have traditionally used items that were the most valuable to them to in their artwork and as decorations on costumes and accessories. Eagle feathers and eagle claws for example have been sacred for many Native Americans in North America. I have seen costumes for ritual dances that were decorated with the lids of chewing tobacco tins, coiled and shaped into bells that jangled as the dancer danced. These costumes were used for dances that were performed to ward off sickness. I talked to a young Indian dancer one time that had CD’s sewn into his costume. When I asked what they meant, he answered “This music is my God”. What is important to learn from this is that the materials used by each artist were extremely valuable as a physical and spiritual offering. This craftsmanship is an expression of our respect for the mysterious powers of nature, or a God, and our dreams, wishes, and hopes. I reflected on this as I stood in Ramirez Sensei’s dojo. I looked at all of the scrolls, flags, photos and other treasures he had used to decorate the walls. I thought to myself, these are his icons. He has decorated his dojo with objects that best express his respect, loyalty and dedication to the martial arts he practices. He has made a place with great sincerity and innocence, a place of his spirit. As a sensei of a “front line dojo”, Ramirez Sensei is far away from the support of his teachers and home organization. The images and photos offered their own sense of spiritual support and confirmation. Being on the front lines sometimes means not being able to attend home seminars, or to be in contact with instructors and peers. The phrase “lonely at the front” takes on a new meaning in this Aikido sense. The farther away one gets from their source I think, the more value that objects representing a connection have. If you live at the base of Mt. Fuji, you don’t need a photo of it on your wall. If you are far way, a photo of your homeland gives comfort and a sense of connection. I found this to be very innocent and beautiful. It is not only Rameriz Sensei’s dojo that holds onto a connection with a photo of the Founder, Morihei Ueshiba. We can’t miss this, or undervalue its importance. Ramirez Sensei brought out a photo to show me. It was a picture of the late AAA Founder, Fumio Toyoda Shihan on his last visit to Puerto Rico three years ago. 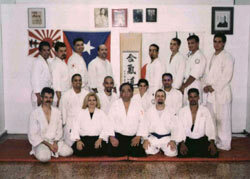 Rameriz Sensei was seated next to Toyoda Shihan at his dojo in Mayaguez. I did not miss the mist in his eyes as he showed me the picture with pride. In our world Aikido community, this kind of small “front line” dojo is of vital importance. I am in full support of the efforts that aikidoists like Rameriz Sensei and the other warriors like him are making. I want to confirm my commitment and my obligation as an instructor to these students. To ignore or think lightly of these small outlying dojos is not good for the future of Aikido, for this is also where the heart is. We need to think about the health of these dojos and give our support for our future to be healthy. We need to be able to be flexible with small dojos that are not financially able to abide by all of the rules and criteria that are current set for associations. We need to be able to allow all students from different socio/economic situations the ability to participate equally. This I believe is very important for our future. In the world there are many high ranking Japanese instructors, and there are many Japanese instructors that are sincere and dedicated to their teaching. I have spoken in this article about Japanese instructors who might have lost their sense of purpose, and become “celebrity” instructors. I have done so to honor and protect the ones that have not. I have wanted to be clear with readers so that you will understand that if you have had experiences as I have described in this article, that not all Japanese instructors are this way. My hope is to protect the image of the Japanese instructors who have made many sacrifices in their own lives to teach the art of Aikido faithfully. It is the “celebrity” instructors that must be clear on the value they place on “revenue versus students”, and need to reflect on their sense of ethics. In our small way, myself and my students at Nippon Kan, through local community service and with projects through AHAN (the Aikido Humanitarian Active Network) are working in this direction. We are doing it now. I hope for the continued success and growth of Rameriz Sensei’s dojo and for the practice of Aikido in all of Puerto Rico. *In this article references are made to Japanese high ranking instructors. These references are in no way referring to Official Aikikai instructors that are dispatched to countries around the world to teach on a rotating basis.